Socially functional genius with a focus on subtractive machining--produces circuitry to drive small scale Cartesian carve bots. Award winning face fur. Freelance fabrication and prop work. One of the advantages of the iPhone 3 over later models was its bowing sides, which allowed cases to fit snugly without needing to come up over the bezel. If you appreciated Jimmy Diresta’s shop-proofed phone case, odds are you’re going to like what Ben Saks is up to. 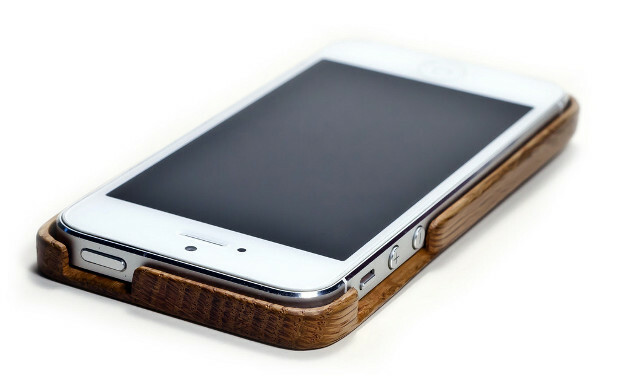 Ben Saks’s new case, shown in oak, holds tight to an iPhone 5. When Ben moved from an Android device to an iPhone 5 earlier this year, the architect and wood worker wanted a case that didn’t interfere with swiping or with the device’s front-facing aesthetic. He wanted to cradle and protect his new iOS device and so set to work milling a reclaimed hardwood window sill into an enclosure that would hug the perimeter of his flat-sided phone without coming over the face. First, though, he had to make it through the learning curve. Post machining, battle number one was that even seasoned stock, cut to a sixteenth-inch thickness, will lose moisture from the newly exposed surface area and then shrink. 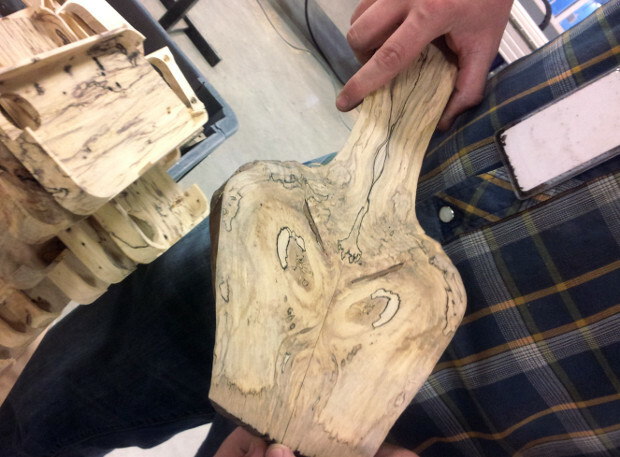 As a material, wood doesn’t want to be both thin and strong. With calipers in hand, Ben set to work on a data set to track the linear contraction in the woods he was trying out. He had to make sure that the median slab would shrink enough to be snug, but not so much as to split itself in two. Ben shows off a pair of pieces from the original log that will find themselves in a different project down the road; left, a stack of roughed maple cases waiting to be finished. The second hurdle was determining how to facilitate tool-less removal; Ben was after a single piece case with a true friction fit. The solution was a cork lining around the case’s inside, replacing the original cardboard option, sandwiched between the wood and the device. Ben points out that there’s a reason why wine makers have been using cork for centuries. The material retains its snug compression fit when squeezed. A bottle of bubbly can last hundreds of years when sealed with the stuff. With that kind of lineage, the lining is sure to last at least the life of his handset. Not only does the cork provide the right kind of fit for Ben’s creation, but it is nicely in line with his other all-natural materials. When I talked with him, he was standing at a ShopBot mill cleaning up the sawdust from some fantastic spalted maple blanks. He had just finished with a vending slot at a local arts fair, the I Made It Market in his home town of Pittsburgh, Pennsylvania. Everything about his work is close to home, and the raw materials are sourced locally and sustainably. His wood supplier, Urban Tree, does business by keeping the dead and dying deciduous in the city from becoming nothing more than landscape mulch. This particular maple log had been sitting in Ben’s workshop for two years before being cut and planed into billets. 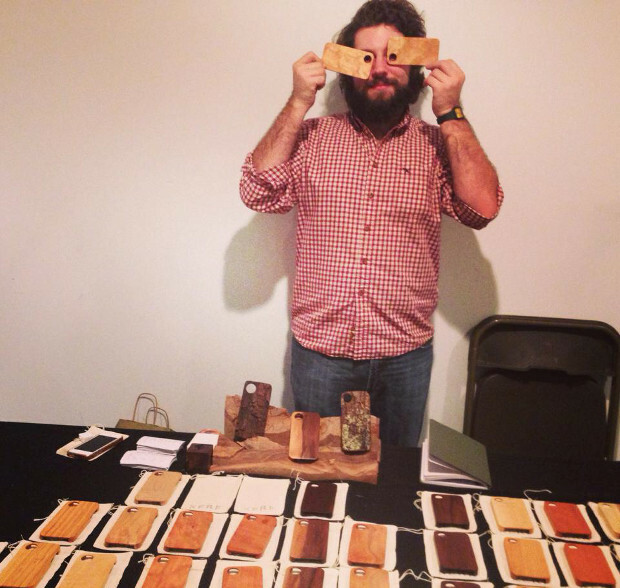 Ben Saks hides behind a maker’s mask at the I Made It Market in Pittsburgh, PA. If someone else decides to manufacture a friction fit case [employing or infringing the patent], then the process and doing the paperwork is vindicated. If not, then I’ve done all this work [on the patent] and it doesn’t allow me to make the cases, it just means that others can’t. Whether or not you approve of the 55-page application, the initial feedback on his work from classmates at his university woodshop was “where can I get one?” rather than just an encouraging “wow, that’s cool.” He took that cue and added to his body of work by going live with Kerf Case as a company and storefront. 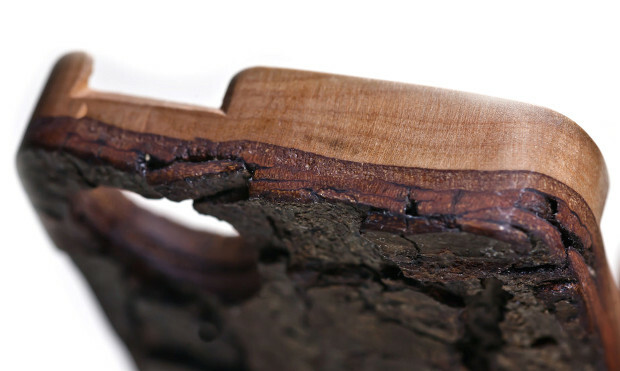 Among the gorgeous ash and cherry pieces are those in the gnarly “Live Edge” line. These are for iOS devotees who live dangerously and are not prone to cutting off their crust. While Ben specifically aims to match the phone’s profile in his standard cases, Live Edge cases come with the bark intact. He uses a process similar to the plastination of animal tissue, essentially a vacuum procedure that draws resin into the grain of the material, to keep Live Edge cases looking freshly hewn. An example in cherry of Kerf’s Live Edge line. Edge cases are distinguished by having their faces left raw and then impregnated with resin to keep them whole. Ben continues to improve his cases, and is starting to experiment with composites. And before you ask, Ben will be starting on the most popular Android devices after the year is out. Topping the list will be the beautiful—and familiarly flat sided—HTC One. Be sure to check out his other work, including producing the documentary Float about the (open source) art of flying rubber-band-powered “duration” models, a sport in which he also competes. Oak case, Live Edge, and masked maker photos by Nicole Jarock via Kerf Case. Workshop photo by E. J. Strauss.